Feature: Get the freshest and fastest shipped brine shrimp eggs for your fish! We are experts at handling and shipping brine shrimp eggs. Our eggs come from trusted US sources. Don't take the chance of getting old or poor quality eggs of unknown origin. Get the best. 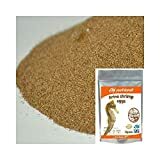 • Get the freshest and fastest shipped brine shrimp eggs for your fish! We are experts at handling and shipping brine shrimp eggs. Our eggs come from trusted US sources. Don't take the chance of getting old or poor quality eggs of unknown origin. Get the best. • These are the popular Great Salt Lake Artemia cysts (brine shrimp). These GSL cysts are over-wintered, washed, dried, and tested under strict guidelines before categorizing into the different hatch rate categories. Average nauplii size at hatching is 440 microns. • These eggs are fresh and come packaged in a resealable stand-up pouch for convenient use. To achieve optimal hatching conditions keep the hatching tank at a temperature of 77-86°f and pH at 7.5-8.5, with a salinity of 25-35ppt. • For best results store cysts in a dry place below 40°f. Analysis: 60% Protein, 24% Fat, 4.4% Ash, 8.5% Moisture Specs: 90% Hatch Rate Artemia Cysts Storage: Keep free from moisture, Store in a cool environment at or below 40°F.